Thank you to JORD Wood Watches for Sponsoring this post. All opinions of this product are 100% my own. See more of my disclosure policy here. I love receiving gifts from my hubby. Don’t we all love it when our husbands shower us with gifts? In the past, I used to expect my hubby to give me a gift for every occasion and maybe non-occasion, too. There were times I would even jokingly tried to make up an occasion to receive a gift. Such as if I needed something new, I’d say something like this: “Well, I just spent the entire day cleaning; how about a little appreciation gift for all that labor?” And then I’ll hint at something I wanted to buy. Not that I couldn’t just buy it myself but it’s always more fun receiving a gift from the hubs, right? Wrong, not when I tried to make up an occasion for one. I always got “the look” from him and then it became a laughing matter afterwards. While this may have been funny to us, I have to admit that when it comes to buying me gifts my husband does a good job with his choices. 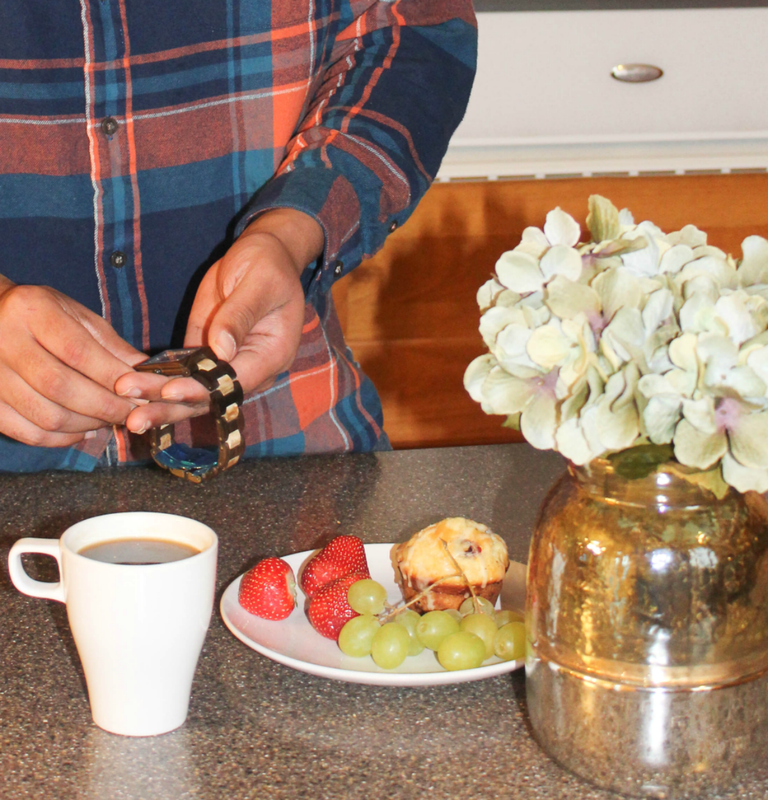 I Especially loves it when he rolls out the jewelry and diamonds (hello upgraded wedding band for our anniversary a few years ago) and even other practical gifts that I can use around the home. Although my husband buys me great gifts, I sometimes find it difficult to know what kinds of gifts to give to him. After all, it’s not always easy figuring what type of gift(s) a man would like and what types of good gifts are out there for men! I even feel like some of the gifts I give to my hubby recurs over and over. Often times, when I am stumped for gift ideas for him I would throw out sneaky (and even not so sneaky) little hints to get him to give ideas. At times I’d get the “I don’t really need anything reply” and other times I’d get a few ideas. Despite it all, I know he appreciates good gifts from me just like I appreciate the awesome gifts he gives to me. But for our anniversary back in December I couldn’t decide what to get him. I know he loves a good watch and was out of one for a while. It’s pretty much the only extra piece of jewelry besides his wedding band he’ll wear. So it was truly convenient (and I was delighted) when JORD Wood Watch offered to send me one of their beautiful timepieces. I knew exactly what I was going to put it towards – a lovely gift to hubby, of course. “We are focused on creating timepieces that are modeled after a modern lifestyle. We value sustainability, efficiency, and experiential living. We make our watches for people who don’t just have somewhere to be, they have somewhere to go”. Judging by the quality of the watch that my husband has I can tell that they truly hold up to their mission. We chose the Golden Camphor & Khaki watch. It’s well-made and has that two toned effect from Dark Sandal and Camphor Wood that were used for creating it. Just look at that finish!! We also love that it is splash proof and while it may not be wise to fully immerse it in water, it certainly will hold up to everyday general use. Another feature that we love about the watch is that it is mechanical so does not need battery. It truly is a cool watch and such a beautiful piece for any lifestyle. Even the packaging it arrived in was well put together. It was securely packaged in this little wooden box and nestled between a tiny pillow. There was no way it was going to be damaged via shipping. There was also a cleaning rag and full instructions for using and taking care of the watch in a separate drawer at the bottom of the box. If that isn’t caring about a product you make then I don’t know what is! When the watch arrived it was a tad too big and my husband needed to remove one link. JORD had already resized it but we left an extra link to ensure that the watch did not arrive too small. When my husband went around trying to find a watch repair shop or jeweler to remove the link, no one wanted to do it. One jeweler claimed that it was “a special” watch so he did not want to ruin it. He eventually took the link out without any problems and the watch is a perfect fit. It is really is an awesome timepiece that we love! 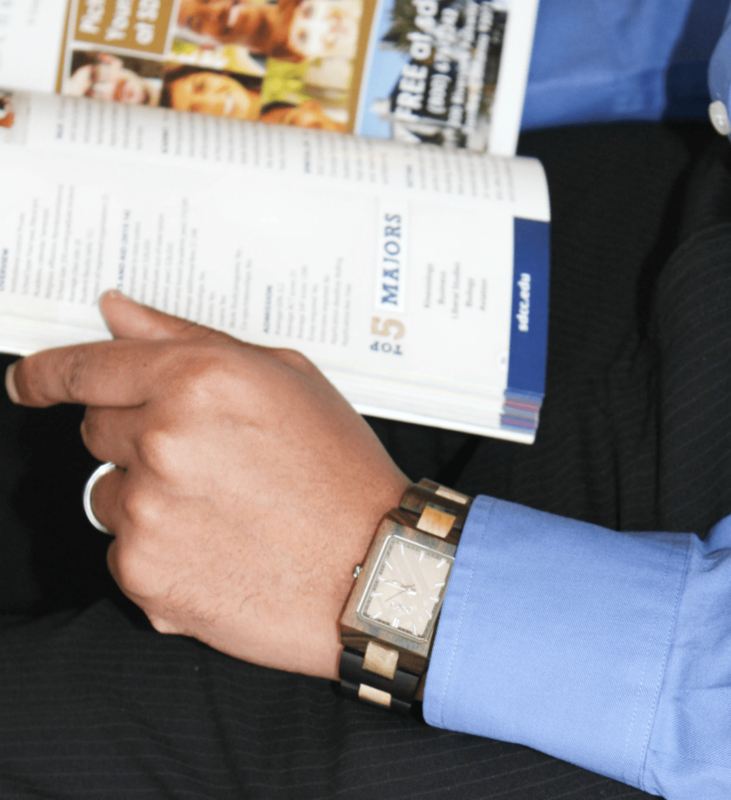 It’s been a while since my husband has been on the blog but you can see him checking out and wearing his new watch. He is super conscious of what he wears and this watch looks really great with any of his outfits, casual, formal, or informal. And as a college Vice President and Dean of Students, he kinda needs something to make him look awesome when he goes to work. Especially in the busy city of Chicago, keeping up with the “time” is important. It’s great to have something that is well-made, all-natural, and Eco-friendly all at the same time. Think I need one – maybe I’ll throw in a few sneaky hints to hubby? 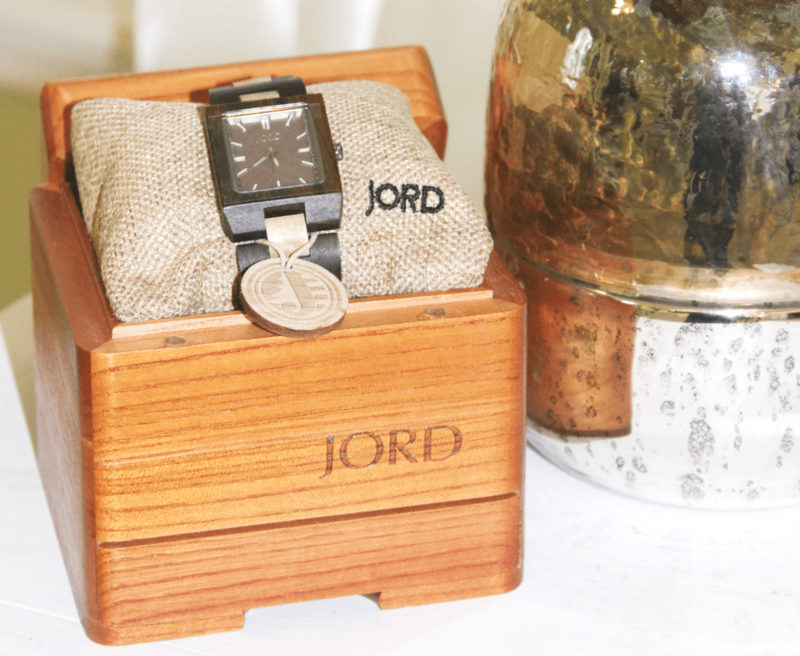 If you are looking for a cool watch to gift to a man or a woman or even for yourself you’ll definitely want to check out JORD’s line of watches. One look at their site and you’ll be in awe with all the gorgeous watches. They are nothing short of incredible and are great for any type of occasion, anniversary, birthdays, holidays, you name it and even ‘just because’. Valentines is just around the corner. I’m sure a special someone will love to have one of these cool watches as a gift. Don’t you think? You can even customize any watch with personalized engraving. 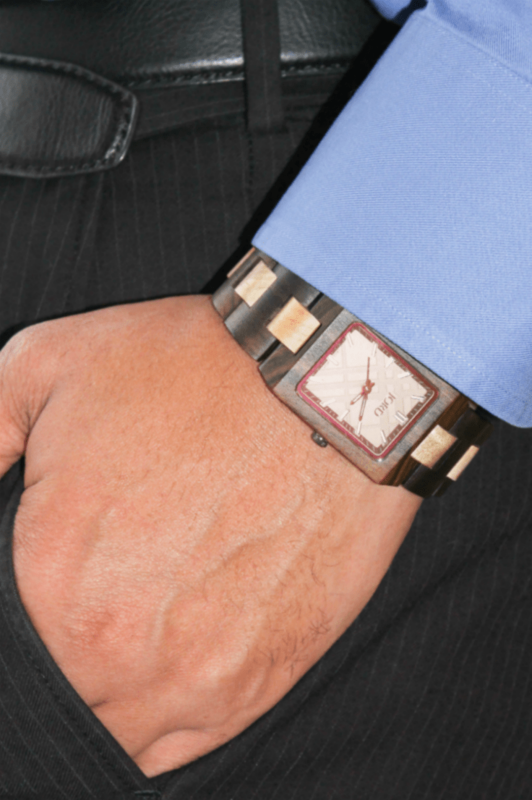 Pop on over to Wood Watch and you’ll probably want to buy not one but two or three watches! But first, don’t miss the giveaway below. 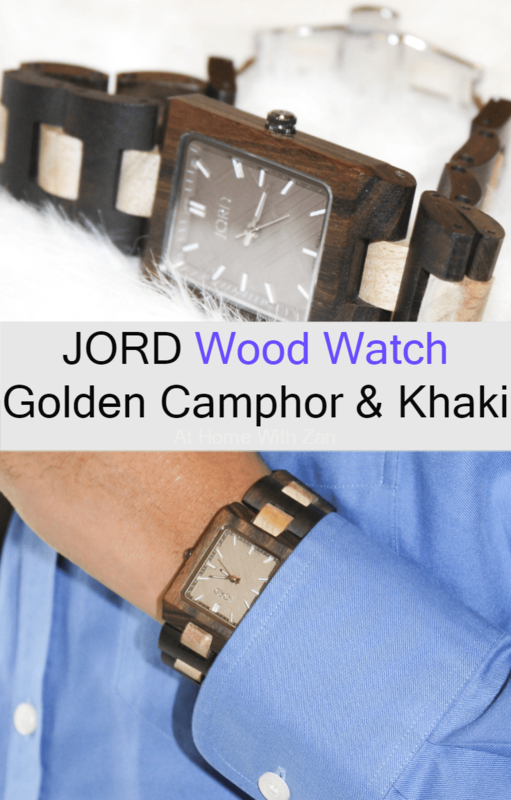 The lovely folks at JORD Wood Watch are offering $100 gift code to one reader toward their purchase. All you need to do is enter your name and email address and you will be added to the contest. Only one person will win, but everyone who enters will be given a $25 code at the end of the contest. How amazing is that! Contest closes on 2/5 at 11:59pm. 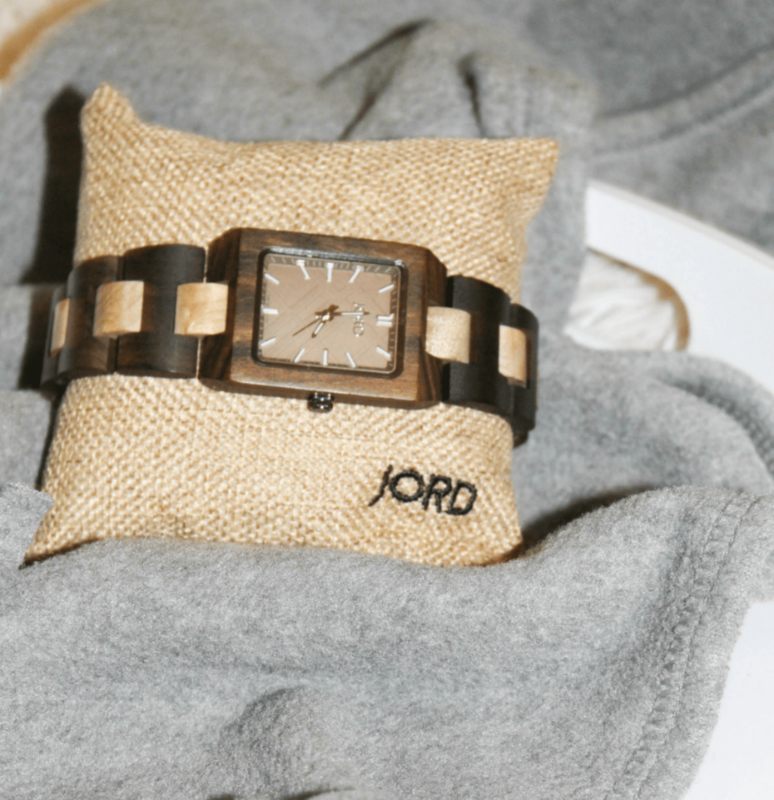 ENTER HERE to win a $100 gift code toward your purchase of one JORD Wood watch. What do you think? 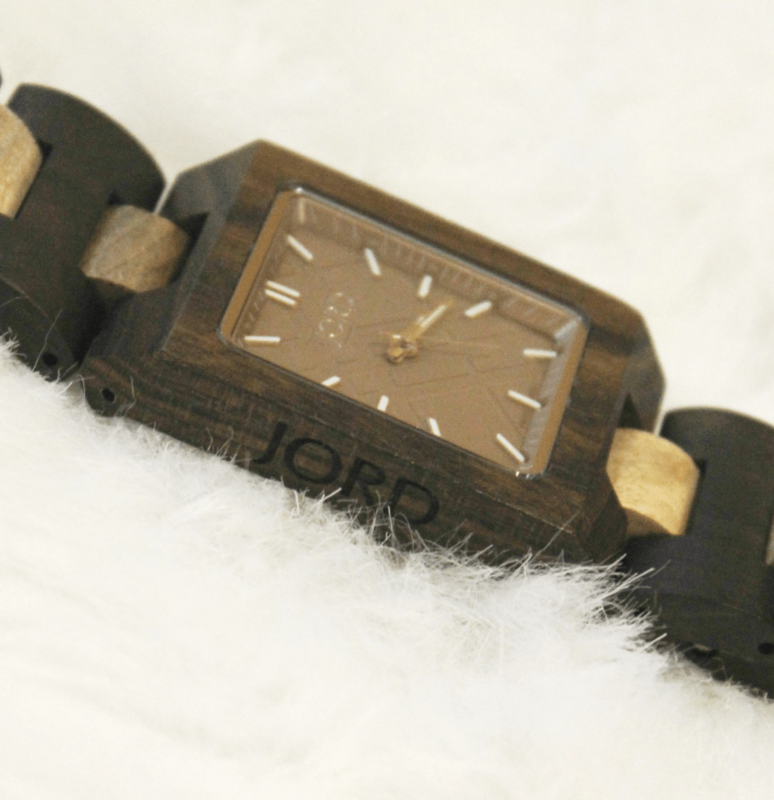 Have you checked out JORD’s line of awesome wood watches yet? Which one is your favorite? It is so hard to buy for my husband! Seems he has everything. I love the Jord watch you gave your husband. It’s so neat and it’s fun seeing your husband on the blog. Love his outfit too! It’s been a while since I brought my husband on the blog but he’s got to show off his new watch!! The watch is really a great one. Thank you Alli!! I love that watch! The square shape is so unique! Great gift for Valentine’s day! Isn’t it! It definitely would be a great Valentines gift for someone!! That watch is so unique and cool! Love it! It is! Thank you Jessica!! My hubby loves his Jord watch so much. We gifted our son-in-law with one for Christmas and I thought he was going to cry for a minute! It’s my turn! I want one. Such a great sale right now too and Valentine’s is on the horizon. That is a bona fide gift giving occasion! Your hubby’s watch is beautiful. Love the watch! What a great gift idea – husbands are so hard to buy for sometimes (at least mine is!) and the watch is gorgeous. Isn’t the watch so cool. I think I need one too.. ha!! It definitely could be hard finding gift ideas for husbands (men) in general. I love the packaging of these watches! Also, they are really easy on the wrist and they are natural which is pretty cool to have! I agree – they are so very light on the wrist. These watches don’t disappoint!!! What a beautiful watch! That looks incredibly comfortable. I’ll have to keep this on the back burner for my hubby’s birthday! Your husband will love it – hope you get one for him!!! An awesome and unique piece for sure! My husband is picky when it comes to watches and I really like the look of the wood watches, but right now he is loving his Fitbit so I guess we’ll have to wait and see if he decides to try something else out. Haha…. sometimes you can’t get them to change but we can only try right? The wood watches are great!! That is such a handsome watch! What a great gift idea. Isn’t it? My husband love it. Thank you so much Lorelai! These are some beautiful watches! I love the two-tone one that you picked. They really are beautiful. The two-toned one is even more beautiful “in person”. This is a beautiful watch and such a cool, timeless piece! Beautiful indeed. Thank you Lauren!